Mercedes Benz E350 at Tint Magic Window Tinting Coral Springs. 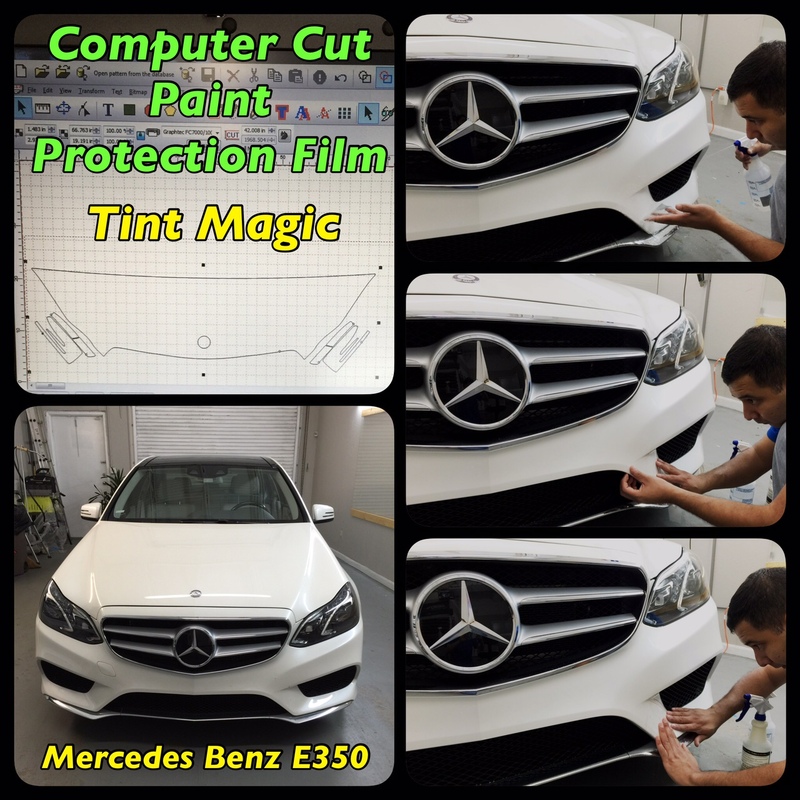 At Tint Magic Window Tinting we have installed Paint Protection Film over Mercedes Benz E350 Hood, Fenders, Mirrors and Bumper to protect the car paint from rocks, salt, insects and road debris. Paint Protection Film is made by SunTek and is virtually invisible and does not alter the aesthetics of your vehicle or factory finish. Tint Magic Window Tinting use computer cut system to pre-cut window film and paint protection film, that means we do NOT use any blades around your windows or your car paint. What the E-class lacks in sportiness, it makes up for with sure-footed handling, style, and comfort. Engine choices include a 195-hp, 2.1-liter turbo-diesel four-cylinder; a 302-hp 3.5-liter V-6; a hybrid setup which pairs the 3.5-liter with an electric motor; and a 329-hp, 3.0-liter twin-turbo V-6. Coupe and convertible models get the twin-turbo V-6 and a 402-hp twin-turbo V-8, while the wagon only offers the 3.5-liter V-6. All, however, treat passengers to a quiet and well-appointed cabin. Mercedes-Benz currently builds almost as many models off the basic E-class platform as General Mills has flavors of Cheerios. Whole grains processed into toroid toddler kibble can be had in 15 varieties at last count. Count up the sedan, wagon, cabriolet, and coupe bodies; tally engines with four-, six-, and eight cylinders; and then stir in High Performance AMG Editions and we count 14 E- Class Models for 2015 without even stretching to include the five CLS-badged four-door “coupes” on this chassis.